Biotechnology Social Development Award is given to and Individual/Social Organization, (NGOs, Trusts etc.) who has contributed significantly towards social development of the community as the case may be. Note : Each award will carry a cash prize of Rs. 5.00 Lakhs alongwith a citation and a trophy. The applicant must be a citizen of India and can be an individual/ extension scientist/ teacher/ NGO/ social organization having done outstanding work towards societal development through biotechnological interventions. Scientists/ teachers engaged in DBT funded projects are also eligible to apply for the award. Application forms and other detailed information including eligibility criteria are available on the DBT website. Just follow the below steps to apply for the Biotechnology Social Development Award 2018. Step 1 : Go to the official website of Department of Biotechnology provided above. Step 3 : Five hard copies of complete application in the prescribed format with required documents may be sent to the following address, both as a hard copy as well as Soft copy (as a single PDF file only). Department will advertise the Award annually on its website (www.dbtindia.nic.in), National Newspapers and Scientific Journals. The awardees will be selected by expert committee duly constituted by the department. 1. Please read Award Guidelines carefully before filling the application form. 2. The application should be submitted in the prescribed format only. 3. Application should not be more than 20 pages including CVs/background of the organization. 4. Separate sheets may be enclosed wherever necessary. 6. Incomplete applications and submission of the application after the last date are liable to be rejected and no communication will be entertained in such cases. 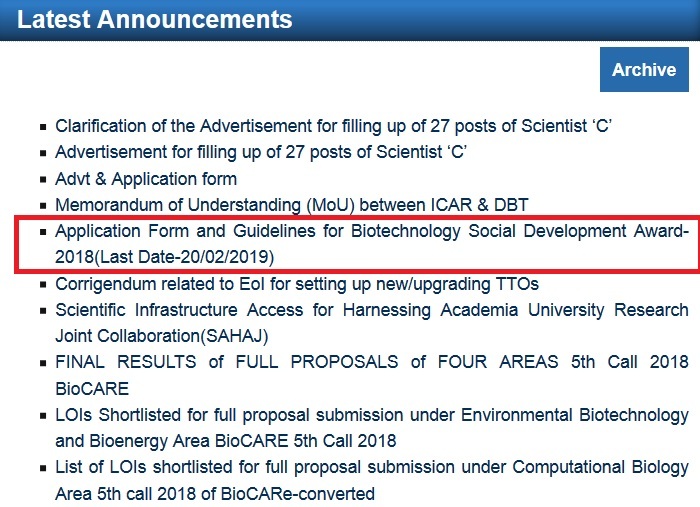 Last date to submit the application form for Biotechnology Social Development Award 2018 is 20/02/2019.